Tailor made fixtures HSK etc. Quickrequest: "Data sheet roller burnishing tool for internal taper"
Remove the locking ring (9) and lift out the cage (3) towards the front until the rollers (5) are clear. Replace the rollers in sets and remount the components. Tip Coat the roller seats with some grease so that the rollers are held in place by the grease during the assembly. When replacing the rollers, clean the cage and the taper. Check it for damage, run-in marks, rough spots etc. and replace worn out components. Worn cages or tapers can considerably reduce the service life of the rollers. Please Note: The fixture is preloaded by the spring. 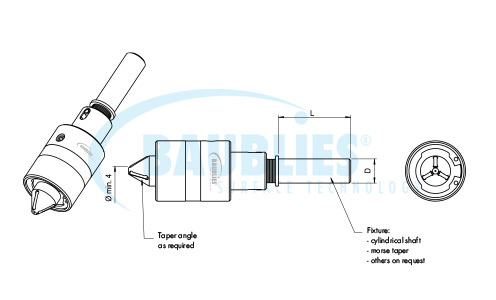 Loosen the clamping screw (8) and lift out the taper (4) and the fixture (1) out of the sleeve (2). Remove the pin (7). 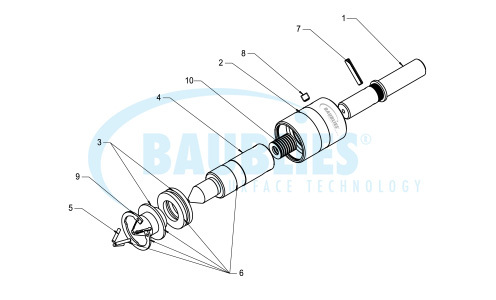 Remove the fixture and the spring (10) from the taper. Coat the parts with some grease before reassembling. Tip When replacing the cage, clean the tool interior and grease it lightly. Dirt particles, in particular chips, reduce the tool life and the quality of t he roller burnishing results. Tool for smoothening and strain hardening of internal tapers.